I’ve started work on Quest 5.2, aiming for a release in the Spring. One of the first new features I’ve implemented begins to take Quest away from “pure” text adventures to open up another type of interactive storytelling – gamebooks, also known as Choose Your Own Adventure (CYOA). The gamebook mode is fundamentally a simple alternative Core library, built on the Quest platform. 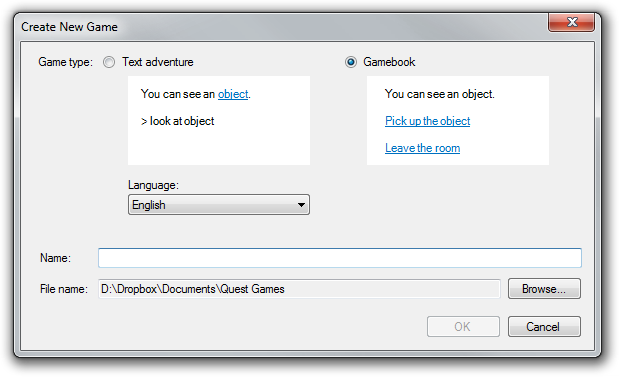 This means that you can create games using Quest’s visual editor, include graphics, upload your game to be played online in a web browser, and have your game converted into an app – everything that a “full” Quest game supports, with the difference that it is much simpler to create and play a gamebook, as players are only given a limited set of choices. 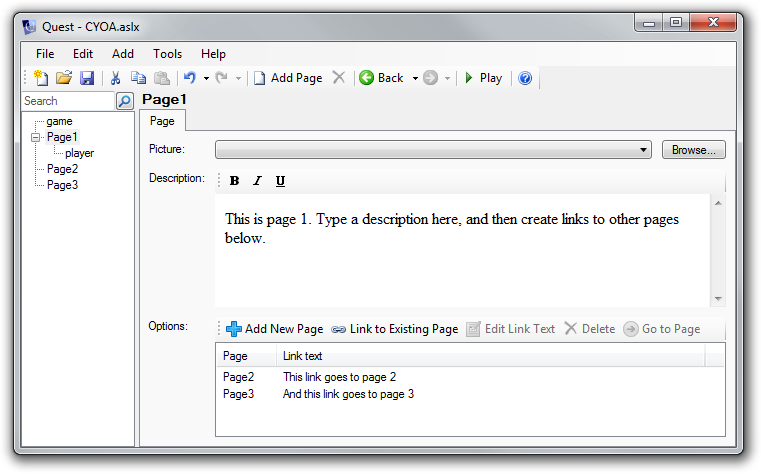 The Editor for Gamebooks is simple – each game comprises a number of pages. Each page has some descriptive text, and links to other pages. 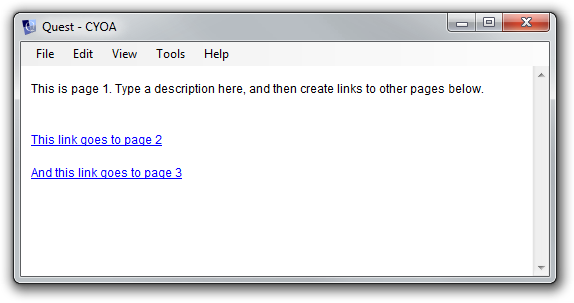 Pages automatically default to names Page1, Page2 etc., but you can call a page any name you like. That’s all there is to it – pretty simple stuff really, at least for this first version. There is definitely potential for adding functionality in the future – because gamebooks are not fundamentally any different from ordinary Quest games, the full power of Quest’s scripting engine is available. This means that different behaviour could be triggered based on the player’s previous choices, random elements could be added, YouTube or Vimeo videos embedded, and a whole lot more. Hopefully this new mode will open up interactive stories to a wider audience – if a full text adventure is too much work, a gamebook is one way of creating an interactive story where you really can focus much more on the writing than the implementation. Gamebook mode is part of Quest 5.2, which is currently in development. I’m aiming to release this around Spring, although there will be a beta version before then. If you want to try it out right now, you will need to build the code yourself. This entry was posted in Quest and tagged gamebook on January 16, 2012 by textadventurescouk. A good idea. Do you have a lot of requests for that ? I think this is a great idea:). The fact that you can use Quest’s features such as images, audio, and YouTube will open up the CYOA genre to another level. Great idea and can’t wait to mess around with the finished product. I have been playing Choice of Games Zombie Exodus on my Ipod Touch and I must say I had more fun playing that then Battlefield 3:). Sounds like this will be a perfect starting platform for introducing people to the fun of writing your own text based games. Straight forward, simple interface but with the potential to add sooo much more when the authors mind opens up to grasp new possibilities… Brilliant. Thank you for helping to spread this art form.